24K gold plated (or silver tone as seen at right) stand with a compass set in base. 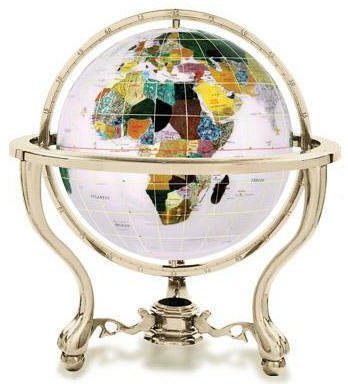 Gemstone globe is handmade with a variety of semi precious stones that are individually hand carved to represent each country and has an option of a beautiful 24K gold plated or silver tone stand with a compass set in base. Each gemstone globe features 25 semi precious stones selected from countries around the world and, where possible, show the country of origin. Longitude, latitude and international date lines are added with a fine gold or silver thread. United States is depicted in different color stones on 13" globe only. Available in the following gem stone colors: Caribbean Blue, Bahama Blue, Marine Blue, Opal, Black Jasper, Peridot Green, Mother of Pearl and Diamond Cut Mother of Pearl. Please view color chart below. Gemstone Globe Care Instructions: use a soft cloth with a small amount of rubbing alcohol to shine and remove fingerprints. Stand Care: On the metal stand or arch, use a soft cotton cloth with a very small amount of hand lotion to remove fingerprints. Use a clean, dry cloth to wipe away the lotion and shine. 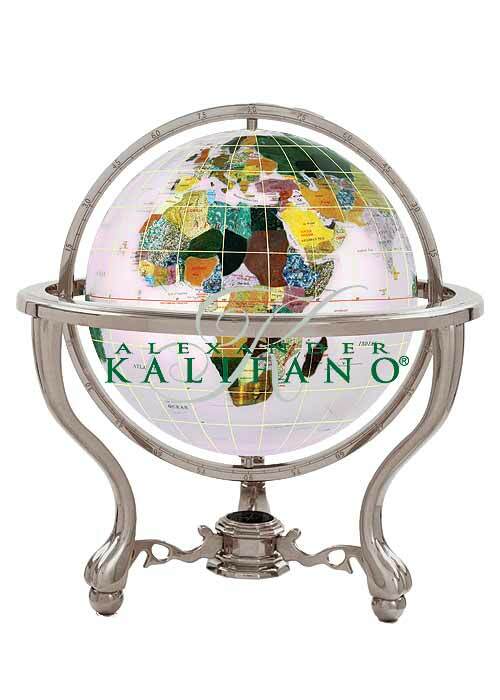 Alexander Kalifano is the largest importer and distributor of fine international home décor items in the United States. For three generations this family-owned business has brought the world’s finest gem stone world globes to customers at affordable prices. Some of the gemstones used include jasper (USA, China), turquoise (Turkey), mother-of-pearl (Canada), tiger eye (Germany), jade (Russia), howlite (Yemen, Tunisia), breciated jasper (Niger), tiger iron (Chad), mookaite (Mali), mohagany stone (Saudi Arabia), aventurine (India, Brazil), rhodonite (Argentina), abalone (Australia), white onyx (Pakistan), yellow jasper (Spain), lapis (Oceans), zebra jasper (Iran), red jasper (Mongolia), unakite (Congo), red aventurine, jade (France, Burma), dalmentioner (Zambia), picasso jasper (Egypt). Any room in your house or office will benefit from displaying these luxurious gemstone globes.